UDM Downloads > Learn To Speak Italian! Learn To Speak Italian V2.7 is specially developed for people who are learning a new language. It includes 420 scenes of common conversation and 742 words of basic vocabulary. It is presented in a small screen format so you can study while doing other work at your computer! This software will make every second of your time useful! 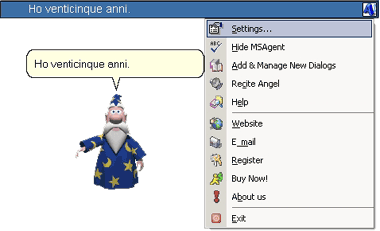 Learn Italian V2.7 comes with a conversation kit, vocabulary builder, pronunciation guide, dictionary, and Reader Angel. Practical and ease of use make Learn Italian V2.7 stand out among the likes. No matter what your Italian level is, you will find that Learn Italian V2.7 is very useful in improving your spoken Italian and building your vocabulary. Future releases/editions will include more learning material for your different needs, and more powerful functions to make your learning easier. Learn Italian V2.7 is an essential tool for you in learning Italian. conversation kit, it is includes the most ordinary scene conversations, there are 420 scenes of common conversation like traveling, shopping, making calls, greetings etc., it can also show in the upper of the screen at the time when you are using you computer, as well as read out by Microsoft TTS, then you can familiar with these conversations unconsciously. vocabulary builder, it collects 742 words of basic vocabulary, it can also show in the upper of the screen for you to remember the words unconsciously. And you can also personal management with adding or deleting the relevant words you like. dictionary, it has 7000 words of basic vocabulary for you to check up the strange words you meet in your study or work. Reader Angel provides reading function for the whole article. you only need to copy the wanted article in the textbox, then use Microsoft TTS to read it out. Learn any Italian words, expressions, idioms, phrases, etc. easily.